While speaking in an exclusive interview with PUNCH Saturday Beats, veteran musician, Professor Linkin, came out fully for Pana crooner, Tekno for failing to acknowledge him as the original owner of the song, “Kpolongo”, which he sampled the hit song in his single, “Jogodo”. According to Professor Linkin who laid his mind bare, Tekno settled Danfo Drivers with N2 million but ignored him. Recall that in the song, Tekno also sampled some lines from a song originally done by a music duo from Ajegunle named Danfo Drivers. When the music duo raised dust over the use of their material, Tekno settled with them in private and is even set to drop a new single with them soon. He told Saturday Beats that he heard rumours that the Danfo Drivers were placated with N2m for the song when they raised dust. He said, “I am the owner of that song ‘Jogodo’ and I hold the copyright to the name, ‘Jogodo’. Tekno did not inform me before he released the song and the funniest part is that after he made the song and Danfo Drivers complained, he went to meet them to apologise but ignored me. 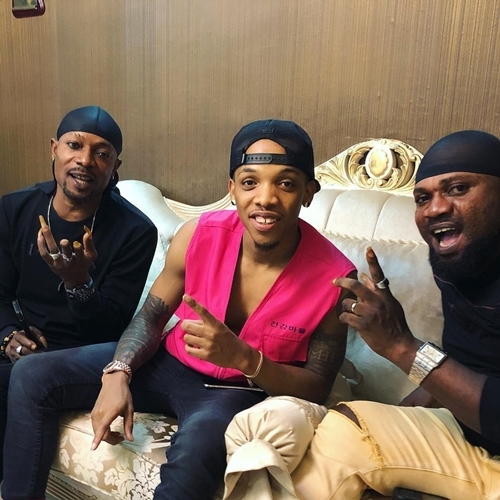 In fact, it was not until Danfo Drivers began to grant interviews to the press stating that Tekno did not inform them before releasing the song that he reached out to them after an event. “Danfo Drivers are my friends and immediately the news broke that they had made peace with Tekno, I called them and asked why they did not tell him that I am the originator of ‘Jogodo’ but they gave me some excuses and claimed that the singer did not give them anything. I am not dead, so why would someone want to take something I worked hard to get. I am the originator of ‘Jogodo’ in the whole world. I am the only one that can tell people the real meaning of the word ‘Jogodo’. I heard rumours that Teckno paid Danfo Drivers N2m. As my friends, I asked them if it was true and they denied it. When I called to ask them, they said that he did not give them anything than apology. They claimed that they sat down, had some drinks, chatted and took pictures. If they are lying, God is watching them because I cannot read their mind,” the singer said. He mentioned his own terms and condition on the matter. “I am the originator of ‘Jogodo’. Before I sang the song, ‘Jogodo’, no one ever used the slang. It was due to the commercial success of my song that the word ‘Jogodo’ became a slang. I just want Tekno to be remorseful and admit that he made a mistake. We are all human beings. I think he or his management is feeling pompous and I do not know why. Probably Danfo Drivers told them that they own ‘Jogodo’, I just don’t know. “I would not drag him to court but I would still monitor the situation before I take a final decision. I know dragging him to court is the right thing to do because what he did is illegal but I would wait and watch to see if he would reach out to me. All I need from him is to give me money or we should do a remix of that song together for the world to know that I am the originator of the song. Now, he is making millions with the song but I have not made a dime over my intellectual property because he is acting as if he is the originator of the song. Most of the songs these boys are singing emanated from Ajegunle but they would refine them and make them seem like their own. It is very bad and so painful,” he said.